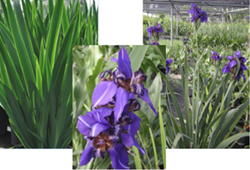 This “cousin” of Blue Walking Iris creates a beautiful vertical accent, forming clumps that average 4′ tall. Green sword-like foliage with 3″ wide violet-blue flowers that appear above the leaves in early summer. Prefers light shade. Needs well-drained soil. Stunning in containers!